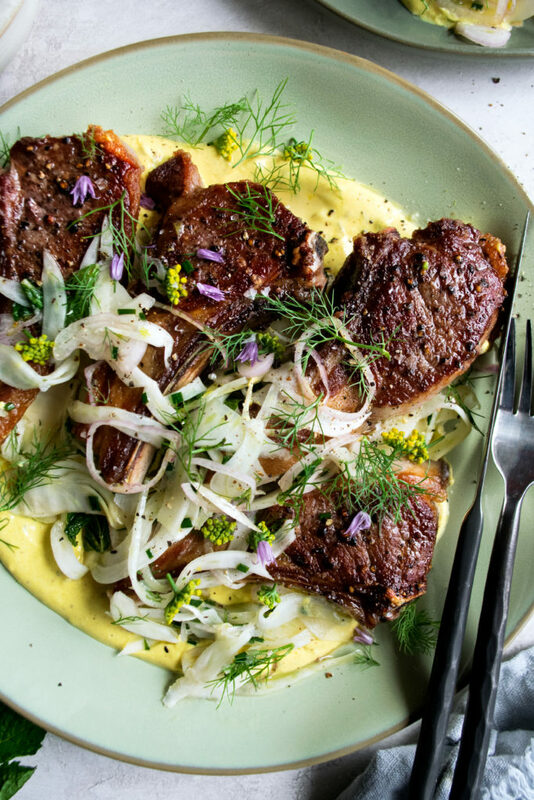 I’ve partnered with the American Lamb Board to bring you the most incredible Easter dish: lamb chops with fennel slaw & spiced yogurt. It’s the perfect combination of classic and unique, all while being perfectly vibrant for a festive spring celebration. If you remember last year, I had the loveliest trip to Five Mary’s Farm with the American Lamb Board. We got to learn all about homegrown lamb and experience the lifestyle of a genuine family ranch. The entire weekend really made me appreciate the quality difference when cooking with local, wholesome lamb. The taste of the meat is very pure…less “gamey” for those who find other lamb a bit intense. It cooks up beautifully as well, resulting in a juicy, tender piece of meat with lots of fresh flavor. 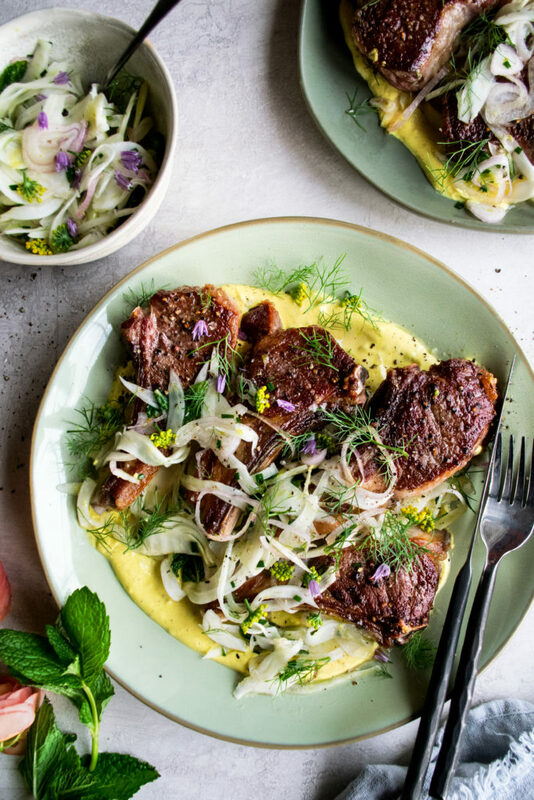 And I’m so excited to bring you a little bit of American lamb inspiration for Easter with today’s recipe using lamb loin chops from my local butcher. 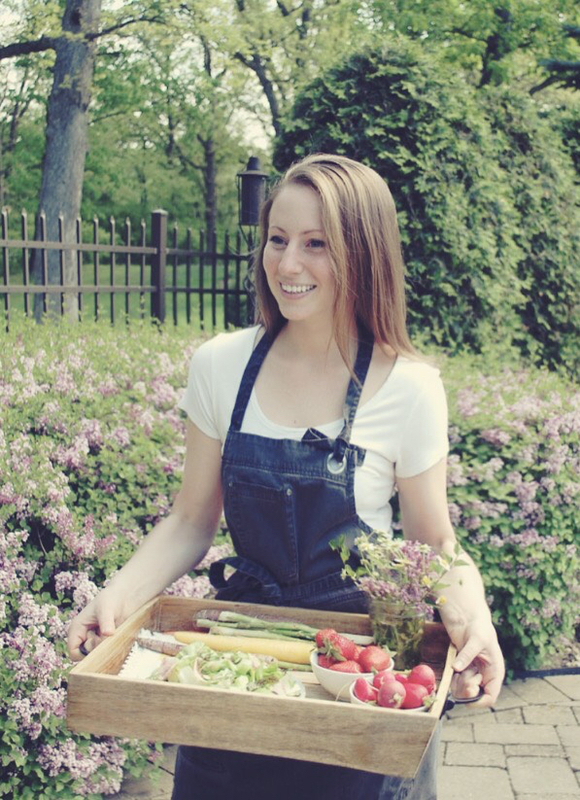 When entertaining this spring, my goal is to find a balance of cooking really exciting, yet really simple food. Lamb is such a staple for an Easter celebration, but I think a lot of the time it can be intimidating. That’s why I love lamb chops because they cook in just minutes in a cast-iron skillet. By ensuring the lamb is at room temperature and is fully dry, you’ll achieve the perfect sear when placing the chops into sizzling hot oil. 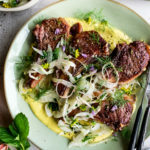 The two other components of the dish – fennel slaw and spiced yogurt – can be made ahead of time and simply pulled out of the fridge when ready to serve. Easy as that. The slaw is bright and crisp, while the yogurt is tangy and rich. Both easy, exciting elements that work together PERFECTLY with the lamb. I hope you enjoy!! Trim a sliver off each end of the quartered fennel and the halved shallots. One by one, place the flat side of each down onto a mandolin. 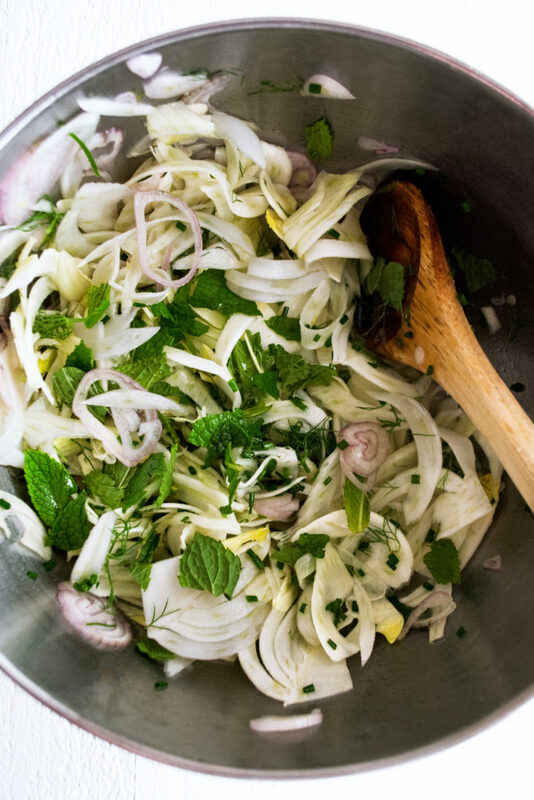 Use the mandolin to shave the fennel and shallots almost paper thin. Place them both in a large mixing bowl. Stir in the lemon juice, olive oil, fennel fronds, chives, and mint. Season with a generous pinch of salt to taste. Let the slaw marinate in the fridge for 30 minutes or up to 2 hours before serving. Whisk the greek yogurt, olive oil, lemon juice, garlic, and spices together in a mixing bowl until smooth. Season with a pinch of salt to taste. Let the lamb chops sit at room temperature for about 30 minutes. Pat them dry and season them well with a generous amount of salt and freshly cracked black pepper. Heat a large cast-iron skillet over medium heat. Once hot, add enough oil to just coat the bottom of the skillet. Once the oil is hot, place half of the lamb chops in the skillet. Sear them for about 3 minutes until crisp and deeply browned on one side. Flip the chops over and continue to cook another 3 minutes longer for medium, or until your desired doneness (thicker chops will take a few minutes longer). Transfer them to a plate and cover loosely with foil while you cook the remaining lamb chops. Spoon the spiced yogurt onto a large serving platter. 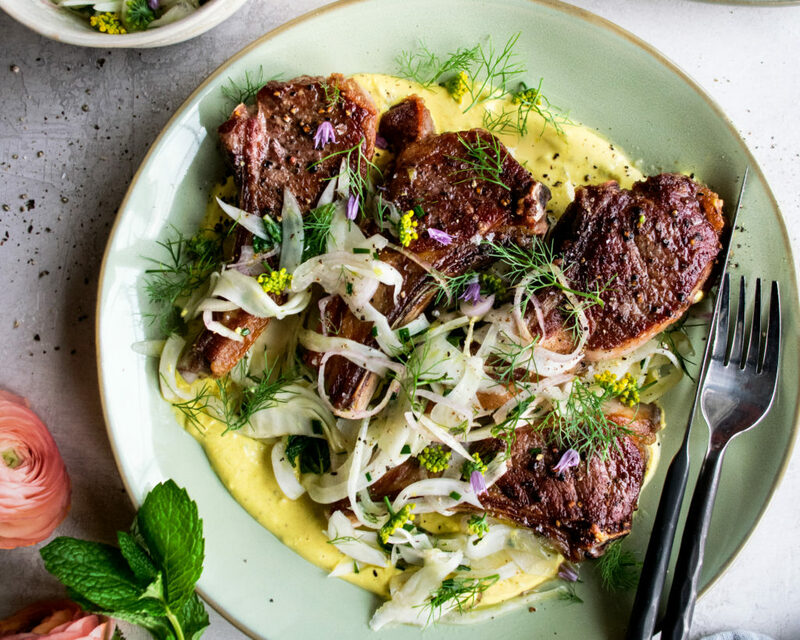 Place the lamb chops onto the yogurt, with the fennel slaw over top.